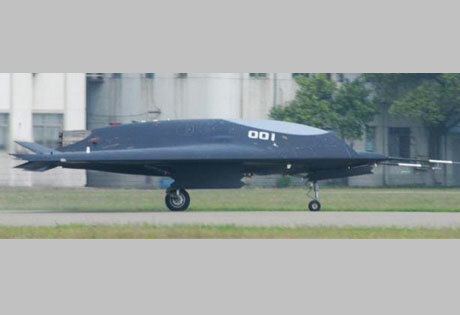 China’s first jet-powered stealth unmanned combat aerial vehicle (UCAV), the Lijian or “Sharp Sword,” was recently spotted undergoing taxiing tests in that country. Analysts interpreted the sighting as indicating that the Lijian’s maiden flight is imminent. The Lijian prototype rolled off the assembly line late last year after three years’ joint development by Hongdu Aviation Industry and Shenyang Aircraft , subsidiaries of the state-owned China Aviation Industry (Avic). Photos of prototype 001 taxiing on the runway of an unidentified air base, likely located in Jiangxi Province where Hongdu Aviation is based, became available on Chinese websites on May 6. The timing was possibly related to the U.S. Department of Defense’s release of its annual report on China’s military strength. That report singles out China’s development of unmanned aircraft as one of the highlights. For the complete story by Brian Hsu of AINonline.com, click here.